When you have lived in a place long enough, there is a tendency to take things in the local area for granted. Viewed through familiar eyes, tourist attractions and experiences can appear a bit on the naff side. Then you begin to see the error of your ways; realising that if you were on holiday you would probably jump at the chance and be first in the queue. Of course, when you are on holiday, all objections are dismissed. It is so much easier to put yourself in the right frame of mind and get into the spirit of things. This was our aim one overcast morning as we walked down to Brixham Harbour, having decided on a boat trip to Torquay. Apart from a brief, sub-two-minute crossing between Greenway and Dittisham and the car ferries linking Kingswear and Dartmouth, Lady had not been on a boat. She stepped on a bit unsteadily and though the snout was working overtime on the sea air, it soon became apparent that being directly over the water was not the same as being in the water. As the boat left the harbour she shifted about a lot and fellow passengers gave her curious and amused looks. She did not seem too sure of herself, a sentiment I soon began to share when the boat came abreast of white breakers and the hand that was not holding the dog's lead grabbed the rail instinctively. Opposite Paignton the waves got larger still but eventually we rocked and swayed our way to dry land at the other side of the bay; wondering if the return trip would be calmer or would be cancelled. Out of the harbour, we walked up Beacon Hill and turned right by the Imperial Hotel, following the sign for the South West Coast Path. I had not walked this stretch for many months and my mental map took a while to unravel. Near Daddyhole Cove, the path goes through a car park and then you veer right and head for Meadfoot Beach. We elected to leave the camera at home and it was nice to have a relaxing walk somewhere, get into a rhythm and not have to stop every few seconds for a photo. Needless to say, we both kept our eyes peeled and treated the day as a plant-finding mission of sorts. Occasionally I scribbled down a note, so we would know exactly where to find something if we came again. At the end of the road by Meadfoot Beach, we took a left and then a second left soon afterwards, and started the return journey back through Lincombe Plantation. My navigation skills deserted me a bit on the way back. Going from memory, we came out at Lisburne Square, higher up than I had intended but it was still a pleasant walk down to the town and the Harbour. The sea looked rough, though. In fact, it looked positively belligerent. To the crew this was clearly water off a duck's back but every other wave made me wonder if I would remember the donning the life jacket instructions or panic and make a hash of it. It took three or four attempts for the boat to pull out of Paignton harbour in reverse and I was relieved when we finally pulled into Brixham. Walking home and looking back ,we saw a sea punctuated with white crests. Incidentally, if you are planning a boat trip across the bay, be sure to pick up a timetable. With two competing ferry companies (each with their own named boats) and two different departure points it can all get a bit confusing. If in any doubt, ask at a kiosk and you will be told where to go. A couple of mornings later we returned to Torquay (this time in the car) and armed with a camera and field guides picked up where we left off. We had not seen one of these before and although the flowers were somewhat past their best further down the stem, it was still an exciting discovery. 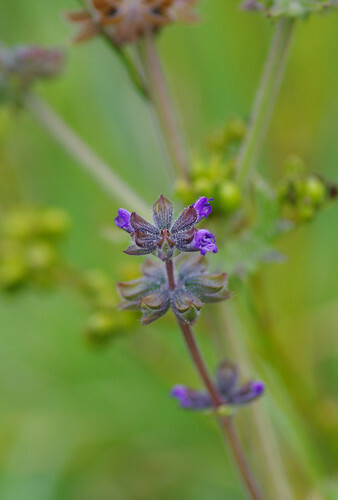 It was also breezy and the whole flower would not stay in focus so Sherry elected to capture just the top of the plant. I had no idea the coast path would yield such treasures in Torquay. 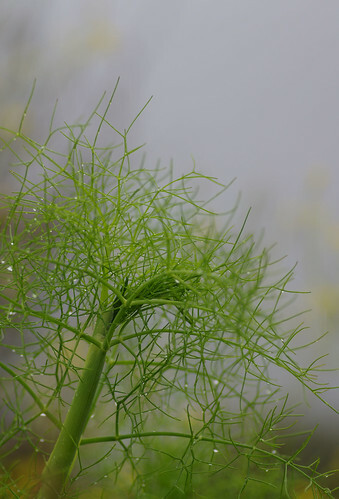 The drizzle dew and the grey background give the impression this fennel might be in front of or behind glass. 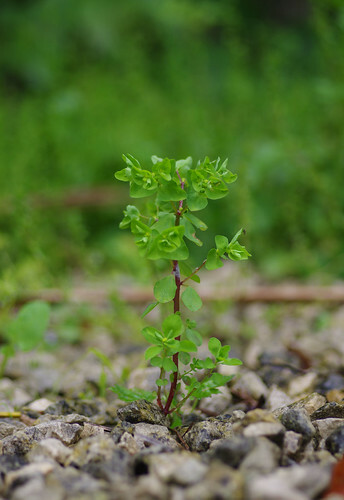 A few weeks ago, near Sharkham Point, I saw just the glossy, green leaves of this plant and was unable to identify it. Since then I have seen the whole plant in many gardens and solved the mystery. The tall flowering spike is unmistakeable and even though it was drizzly and grey I could imagine Torquay had suddenly transformed into the Mediterranean. 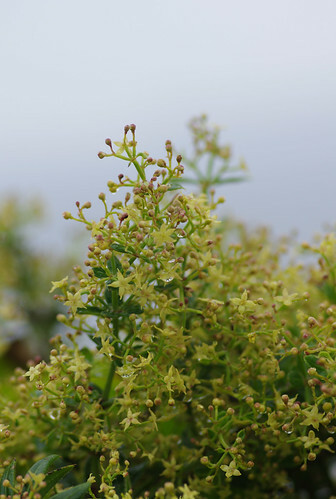 Usually, we see Wild Madder as a mass of dark green in hedges. 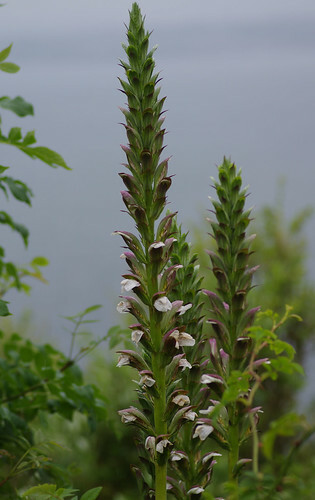 The leaves and stem can be extremely spiky and it tends to be one of those plants that just blends in. 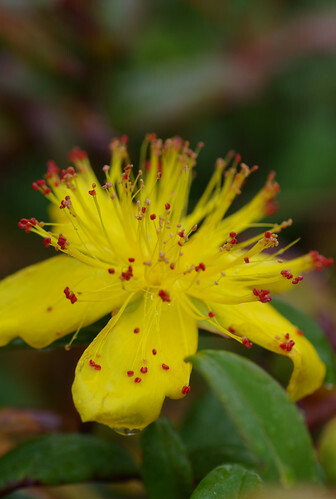 But these yellow, star-shaped flowers are literally bursting with life and character. This is a garden plant and a frequent garden escape. It is not indigenous to the British Isles. According to my guide, the first of the species were brought over from Turkey in the 17th century. Since then they have undoubtably dazzled many an eye and forced passers by to think warm and admiring thoughts. 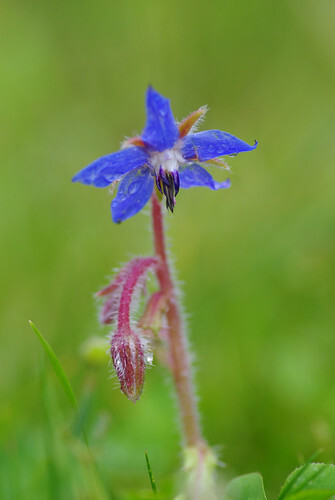 We failed to notice this tiny borage flower on our previous walk. It looks so delicate and fragile and was growing on grass with no other plants around to keep it company. We were almost content to call it a day by this point; to go out on a high, as it were. But the wall outside the Imperial Hotel had other ideas. 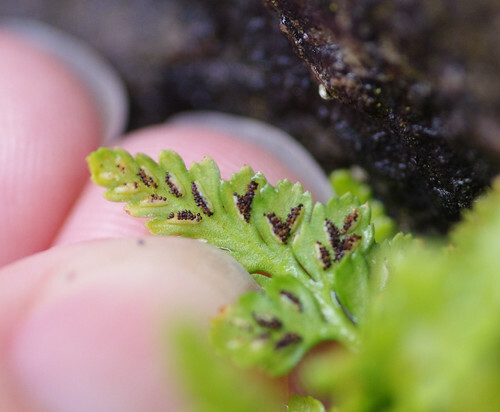 The top photo shows the general shape of the fern. The one above has been heavily cropped and shows the sori underneath which characterises different species. These black dots will grow into something more substantial. Note that the pinnules above my thumb are spiky but rounded, as opposed to the spiky, pointed pinnules of Black Spleenwort. 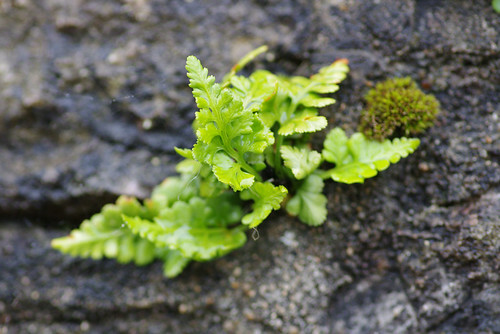 This plant was in a niche in the wall but in more open surroundings, spleenworts are capable of rivalling many other ferns in height. Weeds are given a bad press and have an entire indistry devoted to their destruction. But I admire their tenacity. This species is often found in gardens and on pavements. Sherry thought she would record it. Growing on a wall outside a hotel, I don't think it will be there next time we pass by. At the end of the path, we turned right up the hill and made our way back to our starting point by Meadfoot Beach. These trees were able to thrive in the London smog of yesteryear. Unfortunately they also have deep roots and many in the capital have been cut down because of fears about foundations of buildings being undermined. 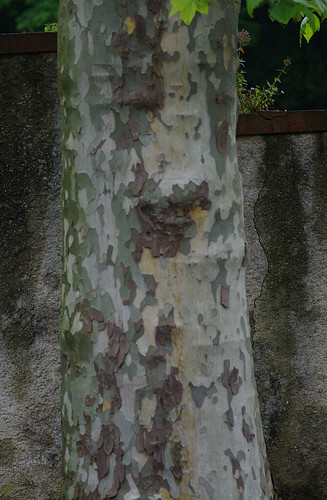 Near the base of London planes there can sometimes be a bump or raised ridge around the trees on the pavement. It is also possible that they have fallen foul of health and safety paranoia. Councils worried about compensation claims might have been a bit over-zealous with their chainsaws.